Keymote iphone application uses beneficial for mackintosh computers users. 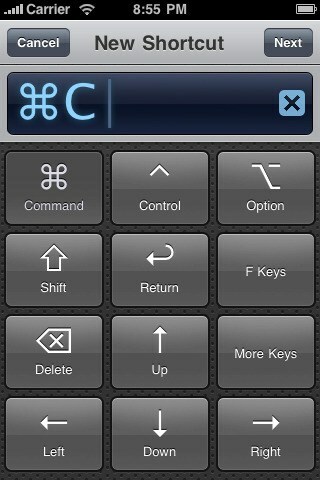 This iphone application allows Macintosh users to control their computer through their phone. This is very valuable to individuals that are constantly in distant locations that need access to important computer documents. This ipod touch application cost less than five dollars and will help you to have access to your computer through specialized keystrokes on your phone. Keymote iPhone app is extremely easy to use and highly functional, and while it is not as detailed as the counterparts offered by other companies, it is a very universally beneficial application. The user will need to download a compatibility application onto their Macintosh computer. Without doing this there will be no way to make sure that the computer and phone can enter into communication using the Keymote app program. Many users are not comfortable downloading software however, the chances of getting a virus on a Macintosh system are almost 0%. Connection between the computer and phone is as simple as a few quick taps of the iPhone touchpad. Once the computer has connected with the Keymote program you can be connected to computer in a matter of seconds. Unfortunately the new connections bar does not come up on its own which can be confusing for first time users because the program will not work without proper configuration. Earlier users have complained about problems between the connection of the phone and the computer. The most recent version of Keymote app for iphone does not have any of these problems and the two components work together very smoothly without any difficulty Each individual key set must have its own name so that the computer and phone can understand the keystrokes necessary when a certain command is given. Programming all of these commands can be reasonably time-consuming however is worth it once the programming process has been completed .Users find that the programming process is the most time-consuming part of the whole experience however they universally seem to agree that it is worth it won’t process has been completed. People that do not want to sit through programming their own keystrokes can download the key strokes of their choice from the free store where the keymote application was originally purchased. The variety of available existing keystokes makes it virtually impossible that you would need to program your own. This is certainly much easier for individuals that do not have the patience to sit through doing the process by themselves. Setting your own keystrokes can be relatively easy however all you need to do is create it and give it a name and then organize it within the existing keystrokes that already are on the system. Whether or not you choose to do this will be a point of style. You also have the opportunity to publish your keystrokes to the store if you feel that they will be beneficial to other users. You must manually change key sets when you change programs in the application. This can take some getting used to for new users. Using this keymote iphone app takes some getting used to because of the very small screen display however it can be helpful for people who need access to their home computer when they are not anywhere near home. Get this cool ipod touch and iPhone app Here.